Free Write Friday with Kellie Elmore. You suddenly find yourself standing alone on an unknown sidewalk in an unknown place. 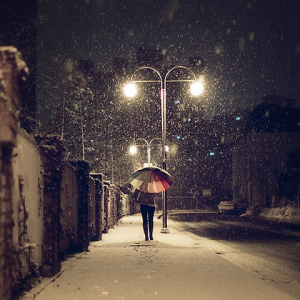 It’s night and snowing and the only other person around is walking away from you…. What an odd weekend of challenges. A triple whammy of emotionally challenging scenarios … at least or me. All topics that hover at a rather deep, and uncomfortable, level for me. In my blog Eyes to Heart I tackled the subject of “abandoned” as far as I dare take it. A couple of days ago in this blog I started writing about the “Twilight Zone” but couldn’t finish. Maybe I will as the week (or year) progresses and I can find a way to reconcile the many heavy themes that popped out of the ether and onto the page. With this free writing challenge it appears the bewilderment of being abandoned and standing in that twilight zone have come to the fore. Pingback: Weekly Photo Challenge: Abandoned (By his Subject) | What's (in) the picture? Walking the line between self-indulgent (even self-pity, maybe) and inspirational is something I struggle with at times. I never want my writing to take on the “victim” modality even though that is part of my life’s story. I have a draft-really a mere start-of a piece that I have been grappling with for at least a year. Truly, I am not sure if it is even worth writing as it is incredibly painful! I understand what you’re saying. Like you I endeavour to ensure the victim vibe does not predominate in my writing. It’s not who I am anymore. The experience of being vulnerable and a victim for a good chunk of my life can’t help but crop up from time to time. But my hope is that the words inspire ~ give hope, offer wisdom and show triumph. Understanding and unraveling, giving voice in a constructive way, is part of the healing journey. So yes, as you say, these kinds of prompts help to “nudge us in a different direction” and “change the narrative” as we move forward. Beautifully written and obviously deeply felt. Well done.